Shopping in Sardinia could be said to be a somewhat low-key affair, with a handful of craft shops in the main tourist areas and local delicacies available in the delis and supermarkets. Though markets in Sardinia always provide a fascinating insight into the local traditions of the island. Different regions of the island are renowned for their craft traditions. Women still make baskets out of rush, willow and dwarf pine leaves in Castelsardo. Ceramics are part of the history of Sardinia and are often painted in blue on white giving them a Greek flavour. You can find these in most shops in the bigger tourist towns and they make a great souvenir. 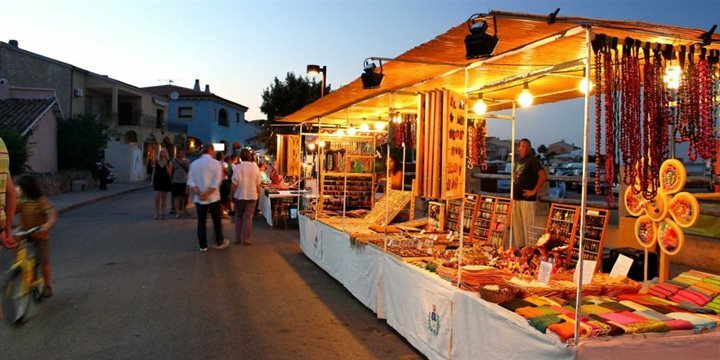 Many markets in Sardinia are also ideal for discovering these craft traditions and picking up a souvenir of your own. Find out more about the best buys to look out for in Sardinian farmers' markets on our blog. Step into the bigger towns and you can almost guarantee some kind of market (Mercato Civile) being on. The bustling markets serve a plethora of fresh fruit and vegetables, fish, meat and other Sardinian specialities. Even if you don’t intend to buy anything, it is still worth a visit, even if only to do a spot of people watching!